Launched amidst significant international, professional and community repercussions in 2007, the Pécs - Ars GEometrica (PAGE) aims to raise awareness of the outcomes of the interaction between the representatives of the arts and sciences and to present the diversity of opportunities behind the application of shared thinking. PAGE establishes connections between various forms of knowledge and methods that promote artistic and scientific achievements, and between cultural patterns of different types and uses. PAGE considers it its mission to have traditional and contemporary scientific and artistic values elevated to the height of community values. PAGE presents the interplay between art and science in terms of opening – with regard to freedom of research and self-expression. Living up to its name, Pécs – Ars GEometrica presents Pécs-related subject matters as well; its current annual themes are centred on the thematic premises of the Pécs 2010 – European Capital of Culture programme. Our speakers and participants are internationally acclaimed active players in a diverse range of scientific and artistic domains. In addition to public conference presentations there are representative exhibitions, outdoor workshops and educational presentations held by scientists, artists, pedagogues; concerts, presentations, movie screenings, and interactive games and much more to make sure everyone will find something of interest. In 2008, PAGE is the official event of the European Year of Intercultural Dialogue. 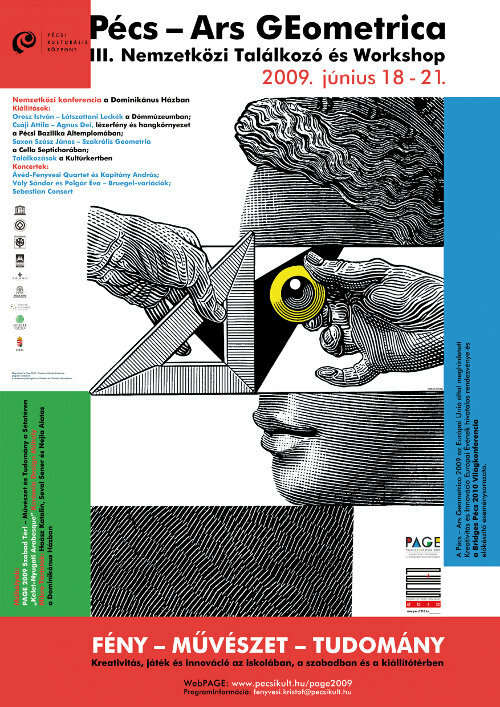 In 2009, PAGE is the official event of the European Year of Creativity and Innovation. In 2009 Spring in cooperation with the Pécs University Faculty of Fine Arts the PAGE launches the 'Interactions and Border Crossings in Art and Science' course, lecturers: Csaba Hegyi, DLA (Pécs University) and Kristóf Fenyvesi, PhD student (Jyävskylä University). in the exhibition hall and out in the open air. SYMMETRY: CULTURE AND SCIENCE, Islamic Art and Symmetry, Vol. 19, 2-3., 2008 Raymond Tennant and György Darvas eds.